Number TWELVE in the GTO Series! Celebrating the GTO's 50th ANNIVERSARY..! Performance Years Enterprises is proud to announce the release of Number Twelve in our GTO Series. THE TIGER IS ON THE LOOSE..! PYE is honoring the "50th ANNIVERSARY" of the Pontiac GTO with our 12th issue in our GTO Series..! Check out the front of the packaging for special 50th ANNIVERSARY artwork..! Check out the cool stance of this Pro Stock GTO with the Yellow Lettered Goodyear skinnies up front & beefy slicks at the rear mounted on Weld Racing Wheels, lift off hood with Pro Stock scoop, blue tinted headlamps, the orange "GTO by PONTIAC" windshield banner, Pro Stock rear spoiler, Dzus Fasteners on the hood & deck lid, dual parachutes with lines, fuel shut off & 12volt power shut off and of course the "GR-RRR!" license plates..! 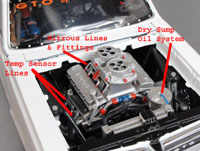 Lift off the Pro Stock hood to see the 572 C.I Pontiac Engine generating over 1500 H.P., capable of turning 7 second quarter mile times at 200 M.P.H. 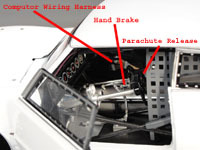 Featuring Pontiac aluminum valve covers, spark plug wires, hoses, dual carburetors with Nitrous Oxide lines & fittings, header temp sensors, dry sump oil system and tube racing chassis. Open the doors & check out the full roll cage with safety net, racing seat & safety harness, the carbon fiber dash & rear wheel wells, full instrumentation including a monster tach. 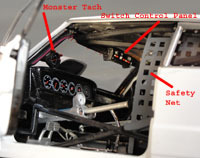 on the dash, two master computer control switch consoles on the upper roll cage, electrical wiring & harnesses, gas, clutch & brake pedals with hand brake, parachute release, the 4-Lenco shifters & linkage, two Nitrous Oxide tanks with lines & valves and the on-board fire extinguisher tanks. While checking out the undercarriage: note the tube chassis and the removable wheelie bar assembly (can be displayed either way), the custom built headers, spark plug wire routing, dry sump oil pick up tubes, Lenco Transmission and the 9" Ford rear axle. ONLY 200 HUNDRED CARS PRODUCED..! 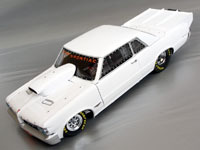 This is a LIMITED EDITION 1/18TH scale model of a Nostalgic Pro Stock GTO. This will look GREAT parked next to Tameless Tiger I or Tameless Tiger II and all of the other diecast Pontiacs. ALSO AVAILABLE... "THE WHITE TIGER" RACING..! Very Limited Edition...ONLY 25 Produced..! All of the details of the #1842 GTO with the vinyl graphics added to this car. Special "One of Twenty-Five" packaging..!